Off the football field , its raining cats and dogs , in Melbourne on Friday night . On the field the Dogs are challenging the Cats , wearing their iconic tri colour football jumpers , featuring the vintage Dog mascot , honouring their Hall of Fame inductees . 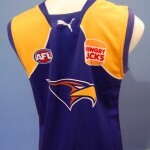 Ardent fans will be wanting to wear this style of celebratory football jumper , jersey , guernsey . Tigers and Hawks battle at the MCG on Saturday afternoon , and Saints versus the Swans on Saturday night , with the Saints desperate for a win to honour Lenny Hayes in his 250th Game . Giants are home to Essendon , and the Kangas play the Lions on Sunday . Melbourne battle Carlton hoping for their first win of the Season . The Western Australian Derby pits the Eagles against the Dockers , and the Crows are home to the Magpies , whilst Port battle Gold Coast in Queensland . Fans have much to enjoy about the weekend's footy and will be barracking wearing their football jumpers , jerseys , guernseys . 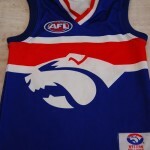 This entry was posted on Friday, May 25th, 2012 at 9:32 pm	and is filed under AFL, football jumpers, NRL. You can follow any responses to this entry through the RSS 2.0 feed. Both comments and pings are currently closed.